Description: NO MAGAZINE SALES into NEW YORK CITY. CONNECTICUT residents must furnish us a copy of your CT Eligibility Permit or ammunition certificate. This listing is for ONE magazine. This listing is for ONE magazine, but winning buyer can take any number of extras we have available at the same per-mag price and no additional shipping charges. Remington’s model 788 Bolt Action Rifle was not a looker at all, like their 700 BDL. It was, however, one of the most accurate rifles ever made. Its looks stand out, more than anything, for the detachable magazines like the ones in our photos. The 788 enjoyed production from 1967 until 1983, and variants chambered in specific calibers, like this .222 magazine’s parents, from ’67 until ’80, then one more short run in 1982. Photos show only a handful of old stock Remington 788 Magazines we found in an old West Warehouse. Manufacturer is Taiwanese, probably HFC / Keymore, on Remington machinery. Construction is entirely blue steel, with the exception of the polymer release lever. Each magazine holds 3 rounds of .222 Remington caliber ammunition. 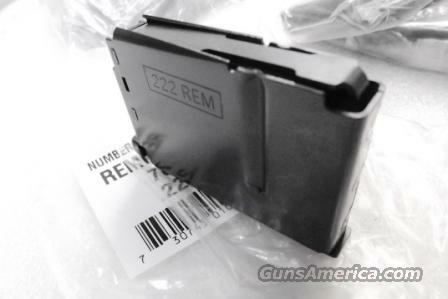 These magazines Will Not Work in any other caliber 788; they Will Not Work in any other model besides a model 788 Remington rifle chambered in .222 caliber. These are excellent, well made magazines, and they work well, from numerous field reports. 788 Magazines are nearly impossible to find; this is the only show in town. We’re offering them each	for only	$ 43.00. Not for sale to residents of New York City. Any magazine deliveries into New York City require written permission of the Police Commissioner, so we cannot ship magazines into any of the six boroughs or 176 some odd zip codes, per NYC Code 10-131.10. Grips, Magazines, Slings, Holsters, Scopes, Mounts, Parts , buy any 3 items and get Free Shipping! Guns and ammo excluded. Lower 48 only. Live checkout orders that qualify will have the shipping fee removed before the order is charged. Single items non gun non ammo, flat $10. $20 Flat Fee any shipment to Alaska, Hawaii, or Puerto Rico. Magazines, small light non-gun items ride free with ammo or gun orders. Checks OK, 7 day hold. GA Pay, MC, Visa, Discover phone- or fax-in 7 3 1 9 8 9 4 7 2 3 orders, USPS Money Order items shipped ASAP please put your full information, item number, and what the item is on any messages. Phone hours 8:00 – 5:00 CST Mon – Fri. Robertson Trading Post 117 Front Street PO Box 365 Henderson, Tennessee 38340. We buy, sell, and trade. Always have, since 1952. $3 Lower 48 First Class Mail Padded Envelope; $10 Priority to AK HI PR. First Class sometimes requires removing the item from its package.